Text Link Brokers SEO Link Building Company offers a variety of SEO link services aimed at increasing search engine rankings through link building. 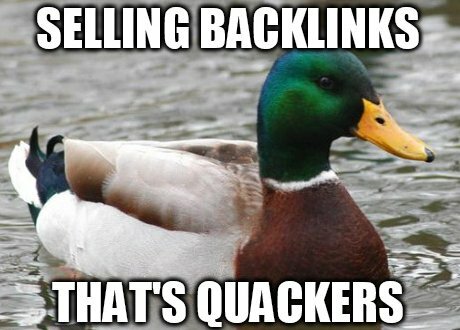 Google in particular relies on quality backlinks to a webpage/site, if you own websites that rank high in Google for search phrases that are competitive your site almost certainly has a decent number of high quality backlinks. Websites tend not to do well in Google until they have a reasonable backlink profile and building backlinks is a constant SEO task, can take up a LOT of a webmasters time. There is nothing more important SEO wise than quality backlinks, a poorly search engine optimized website can rank high due almost entirely to it’s backlinks. Want some proof, check out the “Computer” search in Google: read about it on the Anchor Text Tutorial (see the “How Effective is Anchor Text?” section). I think you’ll agree the one word search Computer is a highly competitive search result, yet look at the ca.com listing (page 2). 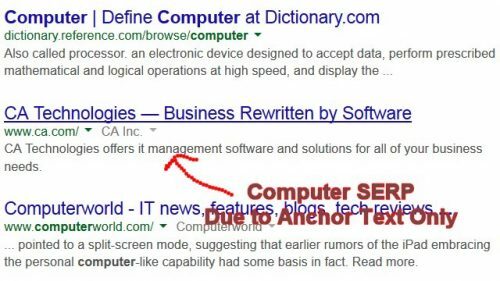 On page SEO wise EVERYTHING is wrong for the Computer SERP, the word computer does not exist on the indexed page in anyway. The page ranks high for that search for one reason, it has a lot of backlinks with the anchor text Computer. Text links/backlinks (whatever you want to call them) are that important to Google rankings, most SEO experts will spend more time on a websites link campaign than on the content of the site. In comparison the best search engine optimized content on a website with no backlinks will NEVER rank high in Google for competitive search phrases. Now you are convinced at the value of backlinks/text links lets take a look at one source of text links: buying backlinks. I’ve not looked at all the link building options available at Text Link Brokers, apparently they offer “Over 2 Dozen Link Building Services”! Here’s some of the more important Text Link Broker link building services. This would be their Rolls Royce of text link building, they say all the text links are custom sourced making it difficult for search engines to spot paid links. Google does penalize websites for both buying and selling text links, for this reason both the buyers and the sellers have to be very careful with who they choose to broker their text link ads. Building custom links is a labor intensive link building service (I know because I’ve offered this sort of SEO service in the past). Custom Link Acquisition is aimed at medium to large businesses with a decent SEO budget, if your website is mission critical and taking big risks on acquiring text links is not an option take a look at TLB’s Custom Link Acquisition Service. The big question for the link buyer is how do they source the links? If you’ve owned a website with a PR4+ home page you might have received an email from Text Link Brokers affiliates asking if you want to sell links (I regularly receive these emails). I guess this is how they source their custom backlinks, manually contacting webmasters to buy links from their websites. The risk for the buyer is how high quality are the websites they source links from (I don’t know). 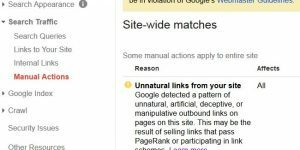 Google actively seeks out both link buyers and link sellers, get caught and you’ll receive a Google penalty or a Google ban. It’s a big risk. In the TextLinkBrokers text link inventory you’ll find thousands of pages you can buy links from. The text links come from all sorts of websites, so obtaining links for most niches is possible. There’s a lot more SEO risk in using this source of links over the Custom Link Acquisition service, but TLB have made it difficult for Google etc… to easily determine a link is paid for. In comparison to Custom Link Acquisition links the links are far more affordable. Biggest issue with this is once Google determines a domain is selling links and they find your link on the domain, you might be in for higher scrutiny. I’m afraid there’s no getting away from the risk of buying/selling links, if you get caught it hurts! The monthly rented text links described above will normally be sidebar and footer links with no surrounding text. It’s believed search engines pass more SEO benefit through a link that is surrounded with relevant text based content, AKA contextual text links. Contextual text link ads are embedded within a short piece of text (100-150 words), giving the link context and more SEO value. Contextual text links are preferred over text links within sidebars/footers, they appear more natural to the user. Same issue as above, when you buy a link this way you won’t be the only link buyer adding links to a particular link sellers domain. You should be realizing by now buying (and selling) text links is an SEO risk, Google considers buying and selling links as black hat SEO. If you can keep below the radar it can work, but it’s not for the faint hearted, get caught and it’s a case of remove the offending links and ask Google for forgiveness. Their Social Boost service builds Facebook likes, Twitter Tweets, shares, votes, and Google plus ones on popular social networking sites. Some SEO experts believe Google is using social network metrics like how many Tweets a page has as part of the Google ranking algorithm. Personally I don’t see Google using Twitter or Facebook signals directly (almost impossible to SEO test social media) because Google does NOT have direct access to Facebook and Twitter. For example my wife has a Facebook account and it’s set so only her small group of Facebook friends see here activity, how can Google know what that Facebook user has liked and shared? 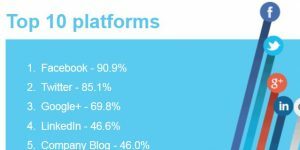 Google Plus is owned by Google, so they have full access to the data, so maybe Google Plus is a ranking signal. 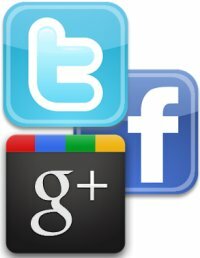 The other social networks it’s about consistency, Google search can’t access all the data and they are at the mercy of how Facebook and Twitter allow Google access to data! Also take into account Facebook and Twitter are just websites, Google indexes all websites they are allowed to spider and index. When Google spiders the open parts of Facebook (not my wife’s account :-)) and Twitter all they find is rel=”nofollow” links which are ignored by Google. For Google to count these links it would have to make an exception for Facebook and Twitter nofollow links, based on the low quality of most of the links from Facebook and Twitter I don’t see it happening. In short this is creating a targeted article on a website with links to your site. Since the article is unique it’s highly unlikely to be seen as a paid link source by Google etc… automatically as long as the domain the guest post is added to doesn’t sell a lot of guest posts. The problem with guest post articles is they lack backlinks and social network activity (Facebook likes, Tweets etc…) to them, as part of the guest posting service Text Link Brokers gives the page a Social Network Boost (as described above: which I doubt has any direct SEO value). If your guest posts find their way on to domains with a lot of guest posts (in bulk guest posts are easy to spot) you could find your site being manually reviewed by Google. When buying guest posts check out the PageRank calculations (under the section “PageRank Calculations and Reciprocal Links”) to see if your guest post links pass much value. Not much point buying links on an article from a domain with a couple of hundred internal links on ever page, the link boost you’ll receive is negligible. The article you are reading now has around 30 internal links (links within the sidebar, footer etc…) and others within the content, probably about 40 internal links in total. If you bought one link from a page like this one from this domain (you bought a guest post: no I don’t sell guest posts), your link would receive just 1/40th of the PR/link benefit flowing through the page: that is not a lot of link benefit (look at the PR calculations). 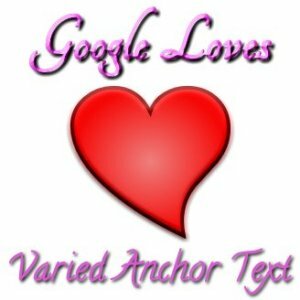 When buying and selling text links you have to be very careful not to get caught by Google. If Google are made aware a website is buying or selling text links, the website runs the risk of a Google penalty. For text link sellers there’s some obvious things not to do, don’t highlight the links you have sold as paid links unless you are preventing link benefit passing (by using rel=”nofollow” which removes the search engine ranking value of a link). For text link buyers think where you are sourcing your paid links, if you find a webmaster selling text links from their site via a forum and they link to the website from the forum, don’t be surprised when the link sellers site is downgraded along with yours. I used to sell sidebar and contextual text link ads from my network of websites to SEO clients, but it resulted in important domains within the network being downgraded and I was really careful. Just not worth the risk selling/buying privately because the seller has to advertise somewhere and once they advertise they are open to Google knowing they sell links. Since I stopped offering SEO services I have no need to offer SEO clients backlinks, if I did I wouldn’t provide them from my own network, I’d outsource SEO clients text link needs to text link sellers and warn them of the risks. Google Penalty for Selling Text Link Ads from another Text Link Ads Seller Company. Before outsourcing my SEO clients text link needs to Text Link Brokers I tried another text link ads seller and was doing OK (was selling links), nothing amazing sales wise, but considering how much SEO benefit a single link costs a site and the prices they charge their clients it’s well worth it. That is if it wasn’t for the risks of a Google slap for selling text link ads! A few months after adding links to a couple of sites there’s been signs of Google penalties, most obvious penalty was a site loosing over 8,000 unique visitors a day! I can weather this traffic loss since I have multiple sites, I could not imagine how bad this would be for a small business with one site trying to make a little extra cash to make ends meet and WHAM, online sales are DEAD! Since I lost a couple of very good sites through this, I’ve put a Google re-inclusion request in admitting to selling text links and explaining they have now been removed. Realistically you can only sell text links from reasonable PR pages and they tend to be the best pages traffic wise, since Google knows I’ve sold links in the past I’ve had to stop selling text links because it’s too risky. I have a feeling Google employees are checking the inventory of some text link ad selling sites (some of them don’t hide their link inventory at all!) and penalizing when they find a site selling links. Text Link Brokers does hide it’s inventory quite well with their non-disclosure agreement which means Google legally can’t log into the the TextLinkBrokers site, sign up for links and penalize them (they would be open to legal proceedings). I’m surprised all text link sellers don’t have non-disclosure agreements to protect their link sellers. I learnt my lesson too late, if you plan to sell text links be very careful how/where you market your inventory. Thanks for all the information on buying links. I am brand new to SEO and am trying to get it all figured out. I had heard good things about Text Link Brokers. Guy just watch out this company they send me a email via my site (cctld) but request (TLD) link placement …. is my mistake din’t realize the poor knowledge they understand on CCTLD and TLD. At the end they request refund and i willing to do that (even i do my duty already) but with the condition of sign my agreement. they refuse, request pay back via paypal and twist all the story ……. When i show proof to Paypal and Paypal favor on me. but they start to write bad about my company without telling the mistake they done, refuse to withdraw agreement ….. So guy please watch out when dealing with this type of company. Before someone thinks what a great idea selling and buying text link ads it should be mentioned what the dangers are, that is it’s actually against Google’s terms of service to purchase links, penalty if that’s what your doing is ultimately banishment from the Google index, but even if they penalise your site you not going to rank. There is no way of Google actually finding that out unless you openly talk about it! Blog commenting is surely a way of getting free backlinks and you can choose blogs with a high PR.